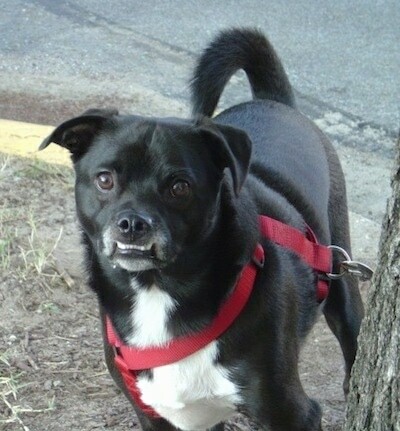 "This is Cody, my Pug / Sheltie mix. He looks a lot like a Puggle, but his ears aren't as floppy and his legs are longer. He turned a year old last month and he's already 27 pounds! I adopted him when he was 6 months old and he is still very hyper despite being neutered and over a year old now. He loves to play fetch which is very un-Pug-like. He is very playful and very friendly. I walk him 4 times a day and try to play fetch or take him to the dog park 3 times a week to tucker him out. He acts like a large breed dog; he definitely doesn't have that human syndrome. He's also a barker, which was surprising. A heavy shedder, too. 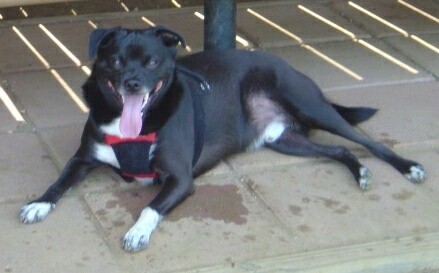 He has the typical Pug underbite and inside sneeze and snoring issues, but a lot more stamina and loves the water." The Sheltie Pug is not a purebred dog. It is a cross between the Shetland Sheepdog and the Pug. The best way to determine the temperament of a mixed breed is to look up all breeds in the cross and know you can get any combination of any of the characteristics found in either breed. Not all of these designer hybrid dogs being bred are 50% purebred to 50% purebred. It is very common for breeders to breed multi-generation crosses. Booger the DNA tested Shetland Sheepdog / Pug mix at 2 years old—"Booger was a rescue dog and we always wondered what breed he was because he didn't act or look like any dog we have seen before. He is super friendly with other people and dogs. He is very playful and rambunctious. Always full of energy (even after neutering). He is very clown-like at times. We noticed that he tends to "herd" other dogs when we go to the dog park. The weird thing is, that he doesn't play with dogs his size or smaller, but he loves to play with bigger dogs!! I finally decided to do the doggy DNA test. Turns out that he is a Sheltie / Pug mix. Now I know why he acts the way he does. He has the traits from both breeds!!" 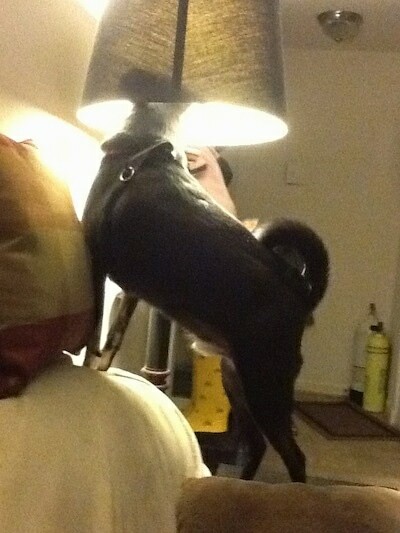 Booger the DNA tested Shetland Sheepdog / Pug mix at 2 years old checking out the light in the lamp.